Born September 14, 1896 in Louisville, Kentucky, Paul Starrett Sample was as active in moving with his family from State to State as he was active in participating in basketball, football, and boxing. After living in Montana, Virginia and California among other places, Sample would enroll in Dartmouth College and become a boxing champion. It wouldn’t be until the year of his graduation in 1921 when Sample would take up painting. Diagnosed with tuberculosis and debilitated from an active lifestyle, he needed something to avert his boredom. At Saranac Lake hospital in New York, Sample would meet the Norwegian-American neo-impressionist painter Jonas Lie. Lie encouraged Sample, who was already a proficient drawer, to start painting. Lie would have a significant impact on Sample, who spent four years at Saranac undergoing treatment. Lie devoted most of his work to harbor and marine scenes and pastoral landscapes, and was vocal about his aversion to modern art. This would greatly influence Sample, who had no previous artistic training. By the time Paul Sample was cured from tuberculosis, he was ready to begin a career in art. After leaving Saranac hospital in 1925, Sample enrolled in art classes at Greenleaf Art School in the later part of the year moved to Monrovia, California. Living in Monrovia he enrolled in the Otis Art Institute. Sample would attend classes and lectures from modern artist Stanton Macdonald-Wright. Macdonald-Wright was well known as an abstractionist, and while Sample respected him as an artist and lecturer, his aversion to modern art learned from Jonas Lie would keep him from being directly influenced by modernism. His talent in drawing would land him a job teaching architectural drawing at University of Southern California where he would teach for the next ten years. At that same time he would join a small group of California Watercolorists that painted cityscapes with local people in their everyday environment. He married Silvia Howland in 1928, at the beginning of the great depression. During the depression, his paintings reflected his sentiment towards the economic crisis affecting people. This style was known as “Social Realism”. His painting Unemployment in 1931 was his first major canvas and received the Isador Gold Medal at the National Academy of Design in 1932. In December of 1934, Time magazine ranked Sample as one of America’s most important living painters. He would start traveling in the summers to Vermont, the home state of his wife, where his style shifted from urban social situations to rural scenes. This style of Regionalism, along with Social Realism, would be the main styles associated with Paul Sample and reflect his most poignant work. After his employment at USC, Paul Sample traveled in Europe where he was able to see works from the masters he admired. He returned to the US in 1938 and assumed a position as artist-in-residence at Dartmouth College as well as serving on jury panels for institutions at the Corcoran Gallery and the Metropolitan Museum of Art. When WWII began, Paul Sample took a job working as an artist-in-correspondent for Time-Life and focused on watercolors. Post-WWII art in America saw more abstracted forms come into style with the New York School and Abstract Expressionism. 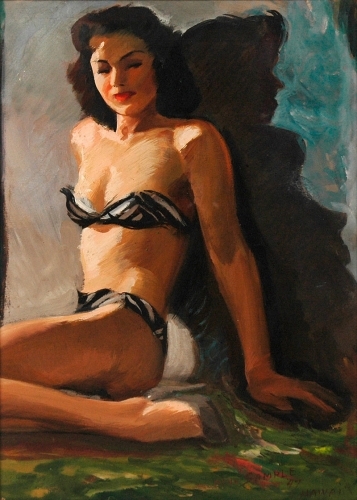 Sample’s conservative style and aversion to abstraction excluded him from mainstream American art. By 1960 his work was only followed in New England, where he was painting at the time. Paul Sample’s influence from Jonas Lie would both assist and hinder his career. His works from the 1930s represent his period most fitting with mainstream American art. He would die on February 26, 1974. Sample’s painterly style was rare for such a late blooming artist. Inspired by his natural ability in drawing, Sample quickly learned to paint proficiently. In fact, H. Lester Cooke, late Curator of paintings at the National Gallery of Art named Sample as one of the finest watercolorists of the twentieth century. Such credit would never have been given had it not been for Sample’s most important influence, Jonas Lie, whom he met while battling tuberculosis. After leaving Saranac Hospital for California, Lie’s influence would remain strong in Sample’s works. 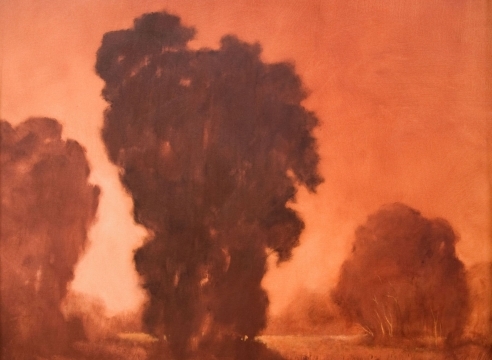 For his first few years on the West Coast, Sample would concentrate on landscape subjects. His painting Inner Harbor received an Honorable Mention at the annual Art Institute of Chicago exhibition, his first important award. A shift in Sample’s work arose during the Great Depression. Although he himself was unaffected economically, his paintings poignantly express the issues his fellow Americans were dealing with. This is the point where we begin to understand the sensitivity and compassion the artist treats his subjects with. In L.A., Sample was able to insert himself into the urban fabric, something he was unable to do in Dartmouth or Lake Saarnac. Leaving the nostalgic rural landscapes behind, Sample was able to apply the same painterly approach and combine it with his empathy for the struggles the Depression-era man was experiencing. This style is characterized as Social Realism and was one of two main styles Sample painted in. Concentrating solely on the actual art of painting, Sample never took a political stance to back up his dejected subject matters. Robert L. McGrath writes that “His concern was more with observing the world than with reforming it, with making art rather than remaking society.” This could easily be attributed to Lie’s influence, which concentrated on the academic craft of painting and was adverse to the avant-garde schools of thought. Important works that epitomized his Social Realism period were Unemployment and Disagreement. After his marriage, Sample would vacation the East Coast frequently. Lacking the urban context of L.A., the artist’s style would shift towards a Regionalist style. Regionalists sought to express the innate spirit of the American land and its people. The despair of the unemployed laborer would be replaced with the agricultural American worker. Sample’s paintings would concentrate on the rural landscape and be complimented with the human worker. Sixteenth-century Flemish Painter Pieter Brueghel the Elder’s paintings would have a great impact on Sample’s oeuvre. Like Brueghel’s works, Sample’s subjects appeared large-scale and rounded. One of his most important works of this period was Church Supper of 1933. Its triangular organization shows Sample’s academic style while the colors show his respective adjustment to the New England landscape. Sample would become a leading Regionalist painter along with Grant Wood and Molly Luce. Unfortunately, Paul Sample was left out of mainstream American art after WWII. This can be attributed Jonas Lie’s influence, who was Sample’s first exposure to art and taught him to reject modernism and abstraction. Although Sample’s later works would depict slightly abstracted landscapes, he could not leave his painterly style. With the rise of Abstract Expressionism, the public no longer had an interest in Regionalism. His watercolors would remain popular in some areas of New England, but the man who was considered one of the best American Watercolorists would be forgotten. 1937 Metropolitan Museum of Art purchases Janitor’s Holiday of 1936. Elected as an associate member of the National Academy of Design. 1. Birth date, Birthplace, Marriage Information. Accessed through Ancestry.com. 2. Exhibition at The Lowe Art Museum, University of Miami. Paul Sample: Ivy League Regionalist. 1984. 3. Falk, Peter Hastings. The Annual Exhibition Record of the National Academy of Design: 1901 1950. Sound View Press, 1990. 4. Gerold Wunderlinch & Co. in association with The Caldwell Gallery. Paul Sample. January 14-March 1, 1997. 5. Hughes, Edan Milton. Artists In California 1786-1940. Sheridan Books, Michigan, 2000. 6. Mantle Fielding’s Dictionary of American Painters Sculptors & Engravers. 7. McGrath, Robert. Paul Sample: Painter of the American Scene. 8. Milch Galleries: Paul Sample. 9. Museums list. Accessed through AskArt.com. 10. Paul Sample: Some Glimpses of the Man & His Work. An Exhibition in the Dartmouth College Library. 11. The Currier Gallery of Art. Manchester, New Hampshire. Paul Sample Retrospective Exhibition 1948. 13. Van der Straeten and Gallery of Contemporary Artists Presents: Paul Sample May 6 - May 29th, 1970. New York, NY. 14. Who Was Who in American Art 1898-1947. 1947 National Academy of Design, Hanover, N.H.
1942 National Academy of Design, Hanover, N.H.
1941 National Academy of Design, Hanover, N.H.
1940 National Academy of Design, Hanover, N.H.